Indiana Bloom is a rare find in North America. Although very popular in Europe, his sire USTINOV has few foals born here . 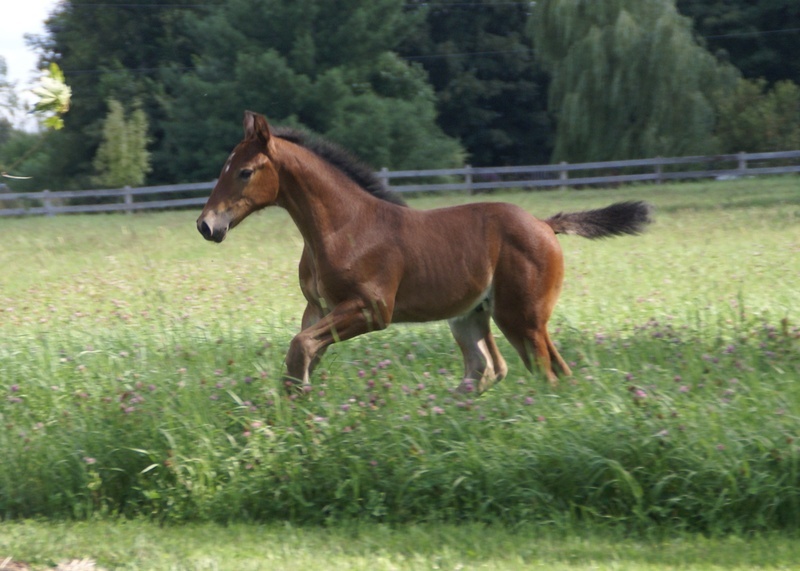 Out of our imported mare Wagrusa H from top mareline, Indy is bred to perform. With good conformation; correct leg, nice top line, Indy is calm but athletic and has what it take to go to the highest level in sport. Ustinov was the uncontested showjumping champion of the 2004 KWPN stallion selection. His beautiful exterior, his superb canter and last but not least his remarkable jumping manners made him stand out among his contemporaries. In the KWPN performance test Ustinov again showed his remarkable qualities and got rewarded with not a single mark below 8.5 for the showjumping components and an 8.5 for his canter. Ustinov's great exterior and jumping qualities are deeply anchored in his pedigree. His sire is the showjumping horse producer Libero H, a legend already in his lifetime. With Jos Lansink this son ofLandgraf I won a respectable series of World Cup competitions and Grand Prix, highlight being his fantastic victory of the 's-Hertogenbosch World Cup finals in 1994. His fighting spirit in combination with his jumping skills and incredible reflexes made the stallion almost unbeatable that season. In total Libero H has less than 600 registered offspring. More than 50 of these are or have been competing at 1.50m or higher international showjumping levels. It is remarkable that many of his internationally successful products also carry the blood of Nimmerdor. Liberty, Coonawarra, Ikoon and Iowa are just a few examples. This fact makes Ustinov's pedigree even more interesting, for he also carries the blood of Nimmerdor on his mother's side. Ustinov has successfully competed In the KWPN stallion competitions were he got rewarded with very high grades for his jumping abilities. In total Libero H has less than 600 registered offspring. More than 50 of these are or have been competing at 1.50m or higher international showjumping levels. It is remarkable that many of his internationally successful products also carry the blood of Nimmerdor. Liberty, Coonawarra, Ikoonand Iowa are just a few examples. This fact makes Ustinov's pedigree even more interesting, for he also carries the blood of Nimmerdor on his mother's side. Ustinov has successfully competed In the KWPN stallion competitions were he got rewarded with very high grades for his jumping abilities.